Santana’s Bucket List – Check! After a year and a half or prayers, we had been blessed to get Santana to the Oregon Coast. She had the time of her life, and Chicago is just as wild about the ocean as she is. I am happy we had one day there where the sun was shining. 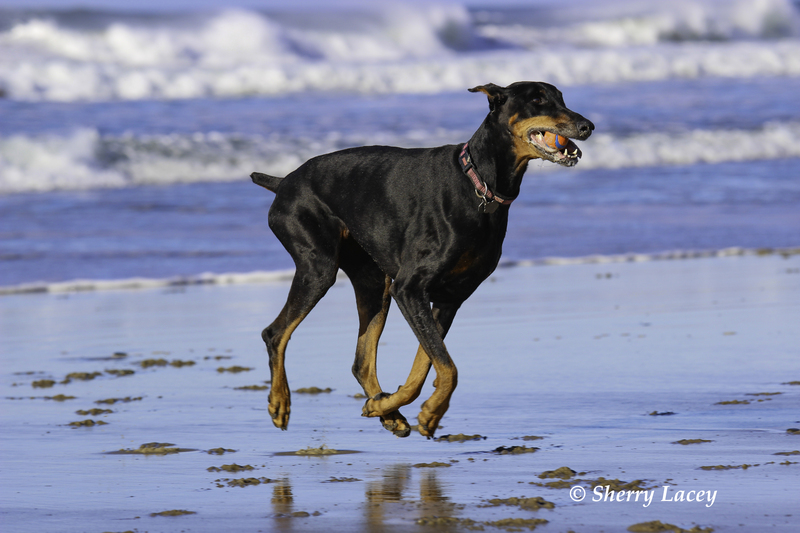 Santana could run like the wind, she was charging through waves, resting in the warm sand, and literately was one of the happiest girls I have ever seen! We always took two balls down for them to chase, and Santana always had one in her mouth. Another thing that was such a thrill to see was her exhilaration when she charged huge flocks of Gulls and sent them scattering like leaves into the skies above. Our prayers had been answered. She had beat the odds of the vets three month diagnosis, and was vibrant and elated. If the weather had not been so cold and miserable we would have stayed longer. However, we thought we would head out, and make our way further down the coast with the hopes of finding some sun and more beaches for her to explore! 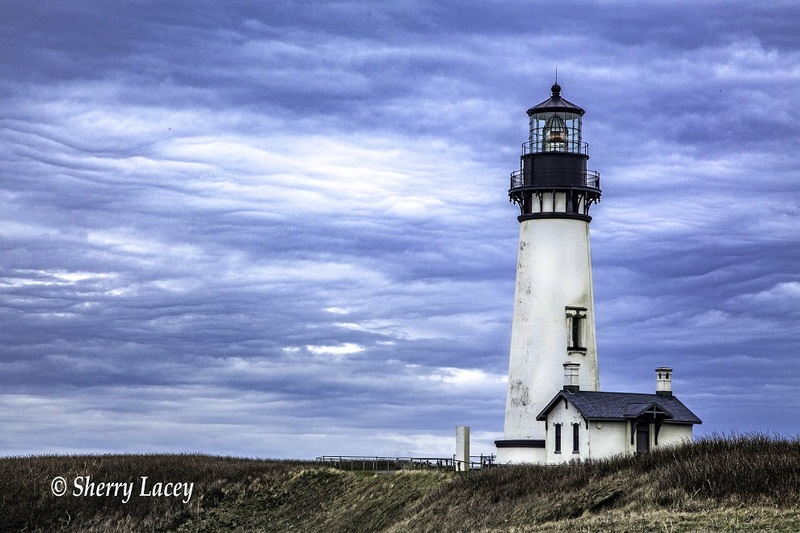 Today we made a stop near Newport and I was able to photograph the Yaquina Light house. I was thrilled with this photo! Apparently they usually charge to go up into the park, but it was Martin Luther King Day… so our visitation fees were waved. That’s always welcome… when you are trying to live on a budget… free is always good 🙂 (Just like complimentary parking at Casino’s). The park itself is quite interesting. They have tours where they take you through the tidal pools when the ocean recedes. Perched on top of the hill overlooking the waves smashing the shoreline below. This is a spectacular light house. I got some great shots, and then a few of the coast line below. We were only there for about 30 minutes. Of course, as with all things Doug and Sherry.. it rained again! Further down the highway we went through Waldport and Cape Pepetua, where we pulled over again to get some photos of a place called “Devil’s Churn”. If the tide had been further in I am sure we would have caught some more impressive photos, but it was till worth the stop. I’ll post some of those later in the Gallery. From there we made our way Florence, Oregon and found The Three Rivers Casino to park for the night. Some people have laughed that we seem to spend a lot of time at Casino’s…. so to make things clear, the answer is no, we do not gamble. However, we do enjoy the wonderful food they offer at the buffets. 🙂 Tomorrow, we cross over from Oregon into California. I can only wish the weather is better, and leave the rain behind!!!!! Cheers for now. We hope you are all save and well ! I am singing raises to God that He allowed Santina to play in the Oregon costline. Yes! We prayed that she would live long enough to run the beaches of Oregon. Her chocolate… just so heart breaking we lost her the same day we left. We miss her terribly. It is like loosing a child. I still look for my Banana. 🙁 However… God did answer all of our prayers that she would make it there…. I am grateful..and I am sad. About salt air, waves splashing around, Sun’s rays touching one with warmth. Kath. you are such a sweetie… I know you too have had a loss.. I will give you a call ok? My head has been so messed up that is was not until today that I could try to catch up on everything….. Love ya hon!